Fans of Mecca Bingo know that the site has recently launched its ‘We Know the Feeling’ campaign. This new tagline is all about the special feeling that we get when we strike it lucky in a bingo game and come away with some cash prizes. Since it’s Christmas, Mecca is now going one step further by inviting each and every player to enjoy that fabulous festive feeling. If you’d like to enjoy some Christmas sparkle and boost your bank balance while you’re at it, the £10K Festive Slots Prize Draw is the perfect promotion for you. During this seasonal offer, 350 players will come away with their share of a £10,000 prize pool. The lucky winner of the top prize will even win a whopping £1,000. All you have to do for your chance to be one of the 350 winners is sign into your Mecca Bingo account between the 9th and 16th of December. Enter the code JINGLE into the ‘My Bonuses’ section and then stake at least £5 on either Jingle Jackpot or Secrets of Christmas. Once you’ve done this, you will have earned yourself one entry into the prize draw, but why stop there? There is no upper limit to how many times each player can be entered into this Christmas competition so keep on playing these two games for more chances to win. The prize draw will then be held on December 19th and all lucky winners will be contacted by email. So just sit back and wait for your prize to arrive. The first slot you can play to take part in the festive prize draw is Novomatic’s Jingle Jackpot. As you might have guessed from the name of the game, this slot is all about Christmas with symbols such as presents, trees, Christmas puddings and, of course, Santa himself. The five reels and 10 pay lines of Jingle Jackpot can be played for as little as 40p or as much as £50 per spin. As well as high prizes to be won in the base game, there are plenty of exciting bonus and extras on offer. These include a nudge feature which moves reels along to creating a winning combination of symbols, scatters and wilds. The second slot which has been selected for Mecca’s prize draw is Secrets of Christmas. Set before a wooden cottage backdrop with bells, cookies, gingerbread houses, presents, toys and Santa Claus as symbols on the reels. There are 25 fixed pay lines across the five reels of this slot. Once you’ve decided on bet size and the value of your coins, you will be left with a wager ranging from 25p to £125. 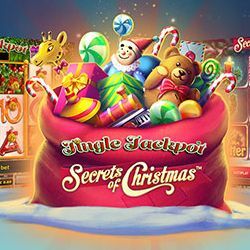 Secrets of Christmas also comes with a whole load of bonus treats including wild reels, free spins and multipliers. The Festive Slots Prize Draw is open to all registered Mecca Bingo customers who are residents of England, Scotland or Wales, whether new or existing. Please note that the promotion is only active from December 9th until December 16th. Only money staked on the selected slots during this period will count as prize draw entries. All winners will be contacted within 48 hours of the prize draw, which takes place on the 17th. It is essential that Mecca Bingo has the correct current details for you, as winners who cannot be contacted within 48 hours will have their prize revoked. Please note that there is a 10X wager requirement attached to all of the bonus money prizes. The bonuses will be valid for seven days after credit and will cease to be valid after this period.